#BREAKING: Syrian air defenses, including S-200 SAMs deployed in Syria against unknown aircraft. UPDATE: Targets being shot at around the al-Tanaf region. Local reports say jets trying to reach an airbase near Damascus. #Israel is concerned about #Iran’s entrenchment in #Syria and is suspected of striking #T4 airbase in #Homs several times, including one strike which killed 7 #IRGC troops. Breaking: Syrian State TV reporting that that between 4 and 6 "hostile" missiles landed around T4 airbase in #Homs with only material damage. One thing is certain, this will not be the last Israeli attack In #Syria. #Syria’s SANA news agency says planes flying in at low altitude via #Jordan passed through the al-Tanf area (where the US has a base) before firing their missiles towards #T4 airbase. The Syrian military is stating that one of the Israeli Jets targeting T4 airbase in #Homs has been hit. No pictures, it didn't happen? Responsibility of refueling the #IsraelAirForce (#IAF) F-15Cs of 106sq & F-35As of 140sq on CAP & HAVCAP duty is with a KC-707 of 120sq with 272 serial number (callsign GIANT4). 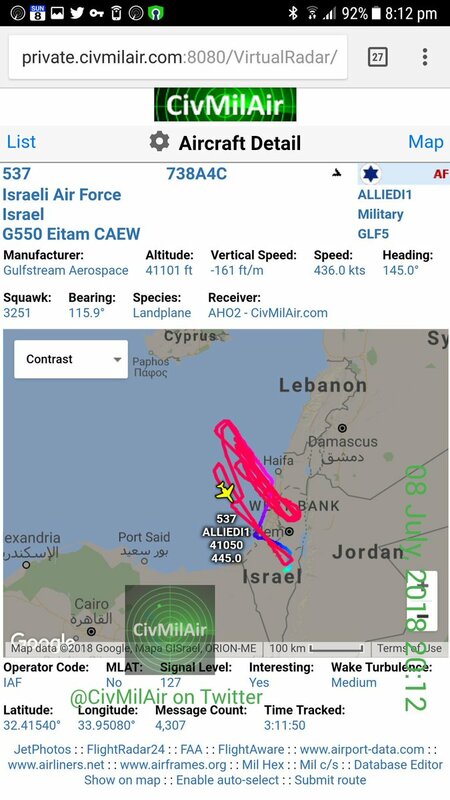 Also a G550 Nachshon Eitam AEW&C with 537 serial number is airborne monitoring #Syria's airspace. #BREAKING: Video recorded minutes ago shows #Syria Air Defense Force Pantsir-S1 SAM systems in action against Dalilah cruise missiles launched by #IsraelAirForce's F-16Is at #T4/#Tiyas AB, #Homs. SyADF claims that 2 Dalilah missiles are shot down but 6 others hit #IRGC positions. #BREAKING: Again #Israel Air Force (#IAF) destroyed a series of recently transferred military shipment of #IRGC in #Syria without being bothered by #Russia|n Air Force. #IRGC troops & their proxy forces are easy targets for #IsraelAirForce to kill in #Syria. 12 missiles were fired 7 were downed by the Syria’s AD systems. Acc. To @mod_gov_sy one hostile jet were hit in the south. Mostly by an S-200 missile. Seems like an IDF jet was struck in Southern #Syria by a regime S-200 system. Still waiting for confirmation. #Syria #SAA almost completely sealed border with #Jordan. What....Israel accused of "Iranophobia"...ah yes...by the regime that routinely threatens Israel's existence and whose leaders call Israel a "cancerous tumor"
Two Israeli lawmakers have visited a flashpoint Jerusalem shrine after Prime Minister Benjamin Netanyahu reportedly lifted a ban on Israeli parliamentarians entering the site. Agriculture Minister Uri Ariel and Likud party member Sharren Haskel visited the hilltop compound, known to Jews as the Temple Mount and to Muslims as the Noble Sanctuary, on Sunday. #Breaking: #Israel's Defense Minister says #Israel has “identified elements” belonging to #Iran & #Shiite proxy militias who “under the auspices of the regime” are trying to "establish terror infrastructure" on the #Syria(n) #Golan Heights. #BREAKING: #Israel defense minister warns #Syria that any soldier who would enter the buffer zone in the Golan Heights "dangers himself". IMPORTANT: The incident in the north could be either spillover from Russian "work" in Syria, an infiltrated drone, or an missile or rocket by Iranian proxies. Will update as soon as confirmed. IDF confirms it launched patriot missiles at a drone approaching Israel from Syria. UPDATE: Drone was intentionally sent to Israel, was intercepted 10 into Israel, over the Kinneret. 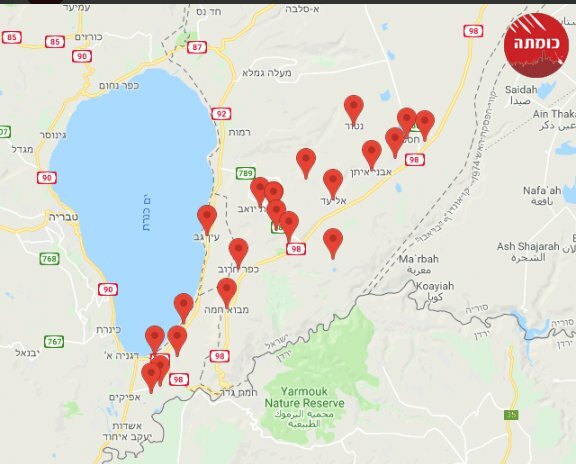 The drone crashed into the Kinneret, and police have evacuated the area. The UAV infiltrated the Israeli border from Syria. The Patriot aerial defense system identified the threat and tracked it until its interception. The IDF will not allow any violation of Israeli airspace and will act against any attempt to hurt its civilians. Details to follow. No sooner @netanyahu wil leave #Moscow, then #Palestine's Abbas lands in #Russia late Thursday to meet with #Putin on Friday. So, there's high chance #MiddleEast peace plan will as well be touched upon at the #Helsinki summit. Pragmatism 99 level: "#Israel 'not ruling out' eventual ties with #Syria's #Assad"
Prime Minister @netanyahu is expected to meet with President Putin at 7 PM Moscow time, so around 2 hours from now. "We waited & tracked drone for 15 minutes before shooting down because of Netanyahu visit to Russia." IDF believes downed aircraft was "Syrian intelligence-gathering drone that flew through Jordan." If the rumors are true and the outlying reasoning behind this Netanyahu-Putin meeting is for Netanyahu to ask permission to order strikes on Iranian targets I predict things would start essentially the moment the PM is on the ground and safe. IDF spokesman: "We are set up against the possibility of breaching sovereignty in the Golan Heights area as a result of the development of Syria's fighting." We will not allow the agreement to be breached in 74 and will not allow the state of Israel to be risked. דובר צה"ל: "אנחנו ערוכים למול אפשרות של הפרת הריבונות באזור רמת הגולן כתוצאה מהתפתחות הלחימה בסוריה. לא נאפשר הפרה של ההסכם ב-74' ולא נאפשר סיכון על מדינת ישראל". "It is not common for drone to stray 10 kilometers into enemy territory, and not common in Israel" but no definitive information yet. Debris landed "south of the Sea of Galilee." IDF confirms it was a Syrian Armed Forces drone. @felschwartz asks if it was Iranian-made. No answer for now. Not yet 100% clear if drone was on military mission and crossed border on purpose or if it was in error. July 11 #Russia President #Putin will meet with #Israel Prime Minister #Netanyahu. They will discuss issues related to bilateral cooperation and also a Palestinian-Israeli settlement and the situation in #Syria. @netanyahu will also attend #FifaWorldCup2018 semi-final game. #BREAKING: Last time after #Russia President #Putin & #Israel Prime Minister #Netanyahu met, #IRGC & its proxy forces were attacked & forced to leave south of #Syria. #Putin & #Netanyahu will have a meeting today to this time discuss about complete #IRGC's withdrawal from #Syria! #BREAKING: Due to threat of #Israel Air Force air strikes against all of #IRGC bases in #Syria under #Russia's permission tonight, Dr. Velayati, special representative & advisor of supreme leader of #Iran's Islamic Regime is due to visit #Russia president #Putin & warn him today! I suppose only time will tell if this turns out accurate or not, Babak said yesterday things could kick off at around 11 PM which would be Israeli time. Israeli PM Netanyahu landed in Moscow, signed football already signed by all other leaders who visited during #WorldCup. PR bonanza. MOSCOW - Israel will prevent all attempts to violate its border, including from air or land, Prime Minister Benjamin Netanyahu said on Wednesday as he met Russia's President Vladimir Putin in Moscow. Their meeting will focus on what is going on in Syria and Iran, Netanyahu added.